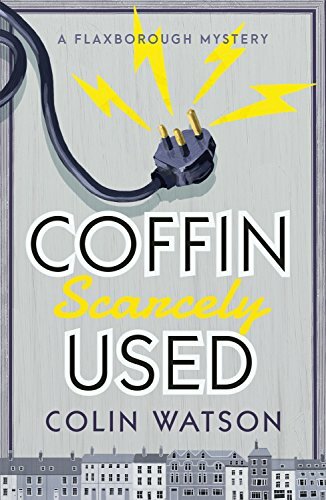 Coffin, Scarcely Used is the first of the Inspector Purbright series, set in the fictional seaside town of Flaxborough. No crime is suspected when a city councillor dies suddenly. But when his neighbor, the former local newspaper publisher, is found dead of electrocution, wearing carpet slippers, underneath an electric pole near his house, questions get asked. As Purbright and his assistant dig into the lives of the two men and their circle they unearth secrets that the foremost citizens of the town would rather keep secret. I didn’t enjoy Coffin, Scarcely Used as much as I hoped. The whole affair seemed to me lightweight and superficial, in the way of the classic English cozies. I generally approve of cozies in the moral sense, but I prefer the grittiness of hard-boiled stories and the more recent generations of procedurals. And the humor, though sometimes fairly Wodehousian, just didn’t move the needle enough for my purposes. But you may feel differently. If Coffin, Scarcely Used sounds to you like your cup of tea, enjoy it.